Wild at Heart is a shockingly violent love story released in 1990 and directed by David Lynch, starring Nicolas Cage. Wild at Heart fits nicely into a small group of seemingly contradictory love stories that feature excessive unpleasantries. The format was pioneered by the 1967 film Bonnie & Clyde which depicted the infamous depression-era couple traveling across America, robbing banks and leaving a trail of bodies behind them. 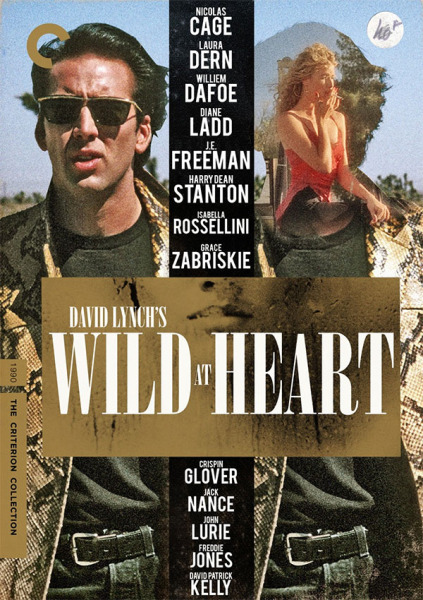 Wild at Heart was released in 1990 and inspired a string of other movies which received more recognition, including True Romance (Tarantino), Natural Born Killers (Oliver Stone), and Thelma & Louise (Ridley Scott). Some of the best movies of the 1990’s. But you don’t need to look at the chronology of these films to feel how on-the-edge Wild at Heart is. In the David Lynch tradition, this movie is sublimely disorienting, and is an emotional roller coaster. Like Bill Paxton in Lost Highway, the protagonist in this movie is impossibly slick (Nic Cage belting out “What do you faggots want?” when surrounded by gang members is one of the most brilliant lines of the film). Like Blue Velvet, its sheer weirdness will discomfort you. And like Mulholland Drive, you will probably struggle to understand what’s going on and feel like you’ve been unknowingly dosed with a hallucinogen. David Lynch, like Wes Anderson, has developed a distinct storytelling methodology and you will see these common characteristics throughout all of his work. Although it hasn’t received the kudos or recognition of Blue Velvet, it’s impressive to stand back and see how influential Wild at Heart has been. Willem Dafoe is one of the most terrifying villains imaginable in this movie. One of his best roles. This isn’t an easy watch, but no David Lynch movie is. If you’re looking for the best work from Nicolas Cage, or for a movie that had a big impact on Quentin Tarantino and gritty love stories of the 1990’s, put this on your short list. Nic Cage does a good Elvis impression. Even better, I’d say, than when Christian Slater has a daydream conversation with Elvis played by Val Kilmer in True Romance.